We will not be frightened when we will be asked to take our staff, because they transport furniture – we are not going to leave this place, “Lelewel” has to stay in Antokol, if we do not manage to win today, we will win tomorrow, if not tomorrow – after tomorrow, but we will win – were talking speakers during the supporting action “Let’s be faithful to The Five”. The rally was held in the pouring rain. 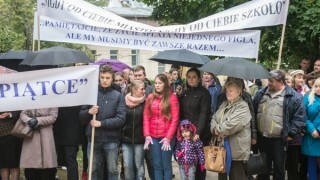 In the courtyard of the Joachim Lelewel High School were gathered parents and graduates, who do not agree to move from Antokol to Zyrmuny. „Teachers informed parents, that till Monday their children have to take their things from the cabinets, because the furniture will be transported. Today, with Beata Bartoszewicz we saw a building in Minties street, where they want to move us. It is not ready, the redecoration is in progress. I do not understand why they want to transport furniture if the building does not meet the demanded standards” – said Danuta Narbut from the Forum of Parents of Polish Schools in Vilnius City, a mother of two students of Joachim Lelewel High School – attendees of the 4th and a preparing class. Danuta Narbut reminded, that in its history, which is longer than 70 years, Polish school in Antokol had many difficult moments, in a soviet period was said that Polish classes will be closed, but thanks to school community, which intervened in this matter even in Moscow, the school survived. She was also talking, that parents who now are fighting for preserving the Polish school in Antokol, felt betrayed by the director. During the rally, there were cited fragments of memories of graduates who belonged to “The Five” (“Piątka”) collected by Krystyna Adamowicz in a book entitled “Always faithful to the Five” (“Zawsze wierni Piątce”), recalling these difficult moments from history of the school. The former students started talking. “There are less and less of us, of the veterans of the school, but even when there left only one, he will come to defend his school” – said Krystyna Adamowicz. A part of a building, in which for nearly 45 years has been operating the High School number 5, then was transformed into Joachim Lelewel High School, a few years ago was handed over to the Lithuanian lower secondary school “ Antakalnio”. Since 1st September 2016, former flatmates feel as if they are the hosts. Only, thanks to parents’ determination Polish-Russian school was not moved into a building in Minties st, which is still undergoing the redecoration. „What are they waiting for? They are waiting for our decision to move, they will chase us like homeless dogs from one place to another. Let’s ask ourselves, who are we: a homeless dog or indigenous folk of this land? The truth lies on our side” – said the vice-minister of Sejm Jarosław Narkiewicz. “Despite betrayals, despite unfavourable situation, we cannot give up. We can win. Even in more unfavourable, difficult times we managed to preserve our education system. (…) A year ago nobody knew, that we can have ten more lower secondary schools, today it is a fact, and recent news – “Syrokomlówka” got the green light for accreditation. A year and a half ago, the construction of the act (the education act – editor’s note) still did not give any chances for school that were appealing for lower secondary schools. Today Biała Waka, Dziewieniszki and Gałgi have a lower secondary school. So your school will also exist. Nowadays, we have got 31 Polish lower secondary schools, and in general, there are chances for 35 lower secondary schools, and it is 10 percent of the general number of these type of schools in Lithuania” – said deputy to the European Parliament, the chairman of AWPL-ZChR Waldemar Tomaszewski. During the action performed a choir the Song and Dance Group “Wileńszczyzna”, which for years had its rehearsals in Joachim Lelewel school. Since the September “Wileńszczyzna” and “Wilia”, which also was taking use of its hospitality, were asked to leave the school by the new “hosts”. The action attendants announced that they are going to fight for the Polish school in Antokol. Not only, because it is the first Polish school, which was established in Vilnius after the war, but also because it is the only Polish school in this part of the city. I suggest to donate a building in Żyrmuny st., redecorated for over 2 mln euro, to the Lithuanian lower secondary school “Antakalnio”, which currently is in an old, built before the second world war edifice of ”The Five”. Then the Joachim Lelewel school could come back to Piaski.